Developed for the municipality or contractor that needs to inspect larger mainline pipes at a competitive cost, the Ratech mini-mainline system extends the capability of the MC-2CA Lateral Service Camera and control unit to be used for mainline inspections up to 24" in diameter. 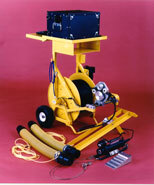 The portable reel supplied comes complete with 500 feet of mainline inspection cable, a continuous contact sealed ‘maintenance free' slip ring assembly (electronic counter optional), two 10" pneumatic wheels and a unique, removable, TRAY TABLE for easy viewing of the video monitor/control unit during inspection. An optional THIRD WHEEL is available for transporting the unit up and down hills, easements or difficult access areas. A mainline adapter tube assembly with pipe spacer plates from 8" to 24" is provided allowing the operator to insert and secure the color mini-camera into the watertight housing for mainline inspection. Lighting is provided with a Lo-Profile 70 watt exterior light-head protected by a rollover bar system in the unlikely event the camera turns upside down within the line. Light intensity is remotely controlled from the camera control unit and/or the optional Light Power Box which is capable of producing up to 500 watts of power for large diameters up to 200 inches. The mini-camera internal lighting system automatically disconnects when the camera is plugged into the adapter tube assembly eliminating any chance of damaging the smaller lamps in the camera. Easily disassembled, the system could fit into a small minivan and/or the trunk of a large sized vehicle. A KEY SAFETY feature designed into the system allows the operator to monitor the video picture SAFELY away from the manhole instead of having to work in front of or near it to monitor the equipment. Ratech Electronics Ltd., 260 Spinnaker Way, Unit#7, Vaughan, ON L4K 4P9. Tel: 905-660-7072; Fax: 905-660-1519.